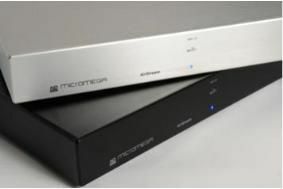 UPDATE: Micromega launches 'wireless DAC' in the UK, now compatible with AirPlay | What Hi-Fi? Micromega's AirStream WM-10 'wireless DAC', launched last year, is now fully compatible with Apple's AirPlay wireless multiroom system. The device works seamlessly with iTunes and owners can stream music from an iPad, iPhone 4 or iPod Touch directly to a WM-10, without requiring any alteration or update. Music can also be streamed via AirPlay to several WM-10s simultaneously to create a multiroom system. A second Micromega component containing AirStream technology will launch in the UK at the end of the first quarter of this year. Now available from UK distributor Absolute Sounds is the AirStream WM-10 – the new 'wireless DAC' from French audio company Micromega. Selling for £999, the WM-10 is based around Apple's AirPort Express wireless solution, the device is designed to stream music from a PC or Mac, along with other wireless devices such as the iPod Touch, iPhone and iPad, and not surprisingly will work seamlessly with iTunes. In addition, attention has been paid to the master clock, used to synchronise the digital data. The WM-10 replaces the AirPort Express's standard oscillator with a 25,000MHz clock with its own low-noise power supply, complete with its own secondary winding on the transformer. The unit is 24-bit/192kHz-capable, and the manufacturer claims that CDs ripped without compression on a computer, then streamed to the WM-10, will actually sound better than playing the disc back directly. 'By storing music on a PC or Mac – be it downloaded from online music stores or 'ripped' from other media – and streaming it to a high-quality hi-fi system via the AirStream WM-10, it is possible to obtain the best of both worlds: the convenience of computer-based hard disk music storage and management, coupled to high- level signal purity and audiophile-quality playback. The Micromega AirStream WM-10 can handle AAC, AIFF, Apple Lossless, MP3, WMA and WAV files, has both analogue stereo and electrical digital outputs, and is available in black or silver.